Minimalism: it seems to be one of the new “it” concepts, like self care and intuitive eating. But what does it really mean? The concept of cutting out the clutter and focusing only on what matters most is appealing to many of us. 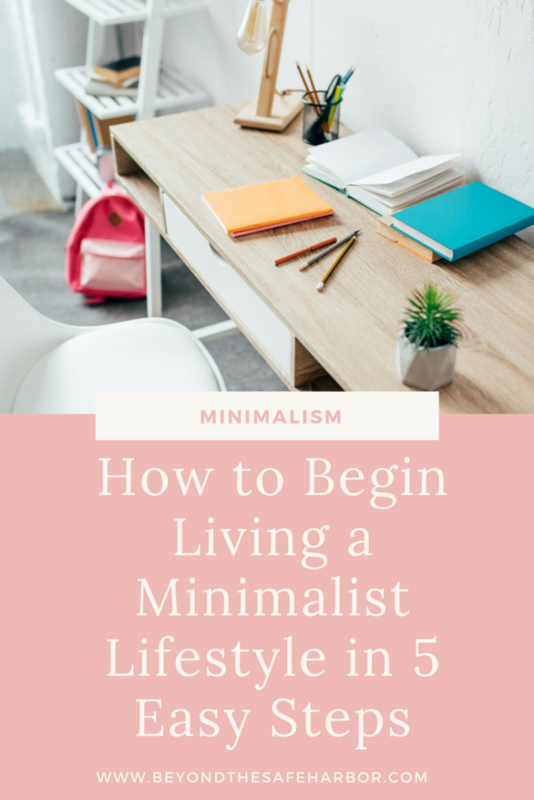 But how can we begin living a minimalist lifestyle? What does that even look like? Today’s post will dig into that in more detail. If, two years ago, you had asked me whether I considered myself a minimalist, I would have given you a resounding NO. I was working full time with few responsibilities, and had no real desire to keep things simple. While I wasn’t irresponsible by any means, I wasn’t terribly intentional about what I bought or the things I surrounded myself with. 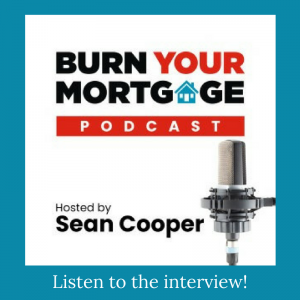 Between leaving my corporate job, starting my blog, buying a home with my now-husband, and getting more interested in mindfulness, a lot in my life has changed. The day-to-day is way more simple, pared down, and intentional. And I have to say, it feels good. While I would by no means consider myself to be a full-fledged minimalist today, I definitely life a more minimalist lifestyle than I have in the past. By stripping out a lot of the “noise” and taking a focused approach to how you spend your time, life becomes something you live more by design than by default. You’re only surrounded by the things that bring you joy. If you’ve read The Life Changing Magic of Tidying Up by Marie Kondo, this concept will be familiar. By eliminating all the “stuff” that doesn’t spark happiness, all that’s left are possessions that contribute to the life you want to live. 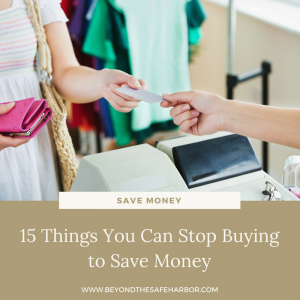 In many cases, you can save money. If you’re keeping things simple, you’re often avoiding spending more money than you have to. For example, if you wear the same set of clothes in more of a capsule wardrobe, you’re saving money from buying additional accessories and clothing. So how can we put this into practice? The concept of “dress with less” can make things way easier! Try creating a capsule wardrobe, simply paring down your closet (find tips here! ), or opting for fewer accessories. By simplifying things, you’ll spend less time deciding what to wear, get more wear out of what you do own, and be less likely to feel the need to buy new clothes. This is one tip that I’ve wholeheartedly adopted especially since starting to work from home. I wear the same 2 sets of gym clothes for my workouts, the same few sets of pyjamas at night, and the same 6 or so comfy work outfits. When it comes to running errands or seeing family and friends, I typically wear the same few pairs of jeans and a handful of tops and sweaters. It’s pretty simple and saves me a lot of time. Plus, I’ve found that by simplifying my outfits on a daily basis, I have lowered my interest in clothes and I never feel like I’m really missing out by not shopping. Despite our best efforts to meal plan and prep, most of us spend far too much time thinking about what we’re going to eat and then making a grocery list, shopping for it, and cooking it. Instead, try to either stick to a similar breakfast, lunch, or dinner for the week, or alternate between a few options. This simplifies the decision making, and you’ll also get better at making each recipe, speeding things up. Plus, if you do your food prep in batches, you can save even more time. This is definitely something we’ve only partially adopted. And while I wish I could eat the same meals on repeat, that’s definitely not the case. But when it comes to certain things like breakfast or snacks, I’m all over it. I make the same overnight oats for breakfast almost every single day (grab the recipe here! ), and other days I have the same thing: an egg and cheese wrap or sandwich. It makes mornings easier and by intentionally choosing to eat a high protein, high fibre meal, I have a ton of energy for the day. Lastly, I can batch-prepare my breakfasts which is super efficient. Before you buy anything, be sure you really need it. Do you have a viable alternative already? Could you make do with what you have? Do you need it now, or could it wait? This can be a major change for many of us, but the more you practice asking these questions, the more natural it will become. And it will prevent you from buying things you don’t need, adding to duplicates or more clutter. For us, this strategy has become more and more innate. Between buying the house last year and planning a wedding and honeymoon for this year, there are many expenses. With that in mind, purchases need to be given more scrutiny and looked at in the context of other costs. For example, do we need to paint the house right now or can it wait a year? Where does getting new shutters rank in the order of home improvements? Thinking this way ensures every decision is made with greater intention. If you’re interested in this concept, I highly suggest reading The Year of Less by Cait Flanders. 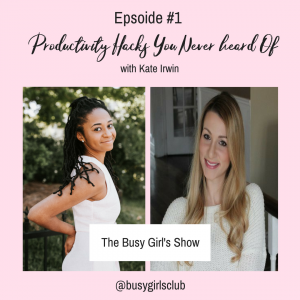 In it, she details her minimalism journey, much of which surrounded paring back her possessions, taking inventory of what she had, and then putting in place strict rules for what she could buy. Minimalism extends beyond our external world and physical things. Taking a more intentional, singular, and focused approach to our work has massive benefits. Instead of trying to squeeze the most out of every moment by multitasking, focus on one main thing at a time, distraction-free, and complete it before moving on to the next. This is something I do religiously. I even try to use time blocks to be more focused. For example, when I was wedding planning, if I had 5 small wedding-related tasks to do, I’ll do them in succession so that I’m still in the same mindset and can hammer them out more easily versus splitting them up between other tasks. I do some light multitasking still, but only when it doesn’t harm my focus. For example, I’ll listen to a podcast while working out, listen to music while cooking, or call my Dad when I’m on a walk. As I talk about in my post Protecting Your Energy: How to Use Social Media the Right Way, our consumption of social media can really impact our mood, mindset, and belief system. And spending too much time on social media and on our phones is never a good thing. Instead, screen time takes us away from connecting with people authentically in real life, getting out in nature, getting in touch with ourselves, and reuniting with a hobby or passion. I am by no means an expert at this, and in fact I spend way too much time on my computer and phone. While much of it is for work, I could still benefit from unplugging more. What I have done, is carve out 30-45 minutes most afternoons for meditation, journalling, or reading. I also try to start every morning with meditation and reading. By integrating these practices into my daily routine, I interrupt my screen time and give my mind a break. Those are my tips on how to begin to live a minimalist lifestyle. Which, if any, do you think you’ll incorporate into your life? And do you have any additional advice on the topic? Leave a comment and let us know!